In a food processor, pulse the almonds until coarsely ground. Add 1/2 cup of the flour and process to a fine powder; transfer to a bowl. In the food processor, pulse the butter and confectioners' sugar until creamy. Pulse in the egg and vanilla. Pulse in the remaining 1 cup plus 1 tablespoon of flour, the almond flour and the salt until a soft dough forms. Pat the pastry into a disk, wrap in plastic and refrigerate until firm, at least 1 hour. Preheat the oven to 325°. On a lightly floured surface, roll out the pastry to a 14-inch round about 1/8 inch thick. Roll the pastry onto the rolling pin and unroll it over an 11 1/2-inch fluted tart pan with a removable bottom. Gently press the pastry into the rim. Fold in the overhanging dough and press to reinforce the side; the side should be twice as thick as the bottom. Trim off any excess pastry and refrigerate until firm. Line the pastry with parchment paper and fill with pie weights or dried beans. Bake the pastry for about 25 minutes, or until set. Remove the parchment and weights and bake for 10 minutes longer, until the crust is golden and cooked through. Let cool slightly. In a large bowl, combine the cream cheese, brown sugar, ground spices, nutmeg and salt. Using an electric mixer, beat at medium speed until smooth. Beat in the pumpkin puree until smooth. Beat in the cream, maple syrup, vanilla and eggs at low speed until blended. Put the crust on a large, sturdy baking sheet and set it in the oven. Pour the pumpkin custard into the crust. Bake for 30 to 35 minutes, until the custard is just set but still slightly jiggly in the center. Cover the edge with foil if the crust starts to brown too much. Transfer to a rack and let cool completely. In a medium saucepan, combine the cranberries with 1/2 cup of water and cook over moderate heat until they begin to pop, about 5 minutes. Let cool. Transfer to a blender and puree until smooth. Strain the puree through a fine sieve. Rinse out the saucepan. Add the sugar and 1/4 cup of water to the saucepan and bring to a boil, stirring, until dissolved. Let cool. Stir in the orange juice and cranberry puree. In a small bowl, sprinkle the gelatin over 2 tablespoons of water and let stand until softened, 5 minutes. Microwave for 10 seconds, or until completely melted. Whisk the gelatin into the cranberry mixture and pour the gelée over the pumpkin custard; shake it gently to even it out. 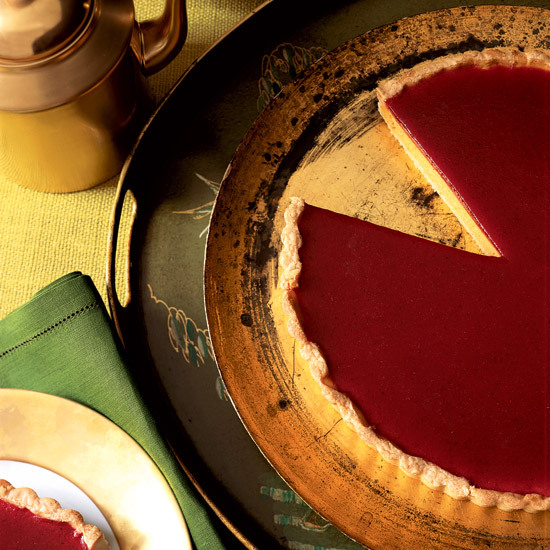 Refrigerate the tart until set, at least 1 hour and up to 2 days. Remove the tart ring and serve. Cooking Club Tip: Blind baking refers to baking a pie or tart crust without its filling. The shell is usually pricked with a fork to prevent bubbling, lined with foil and weighed down with dried beans, raw rice or pie weights. The foil and beans are removed once the crust is set and firm to allow the bottom to brown and bake evenly. Blind baking gives the crust a head start when making pies or tarts with very moist or precooked filling.